I am a retired potato farmer from Baiting Hollow, just north of Riverhead near the Long Island Sound. I own and fly a BIRD similar to the one in the Cradle of Aviation Museum, but powered by a slightly more modern engine designed in the late 1920s. The Cradle of Aviation Museum's model A BIRD is powered by an OX-5, water-cooled, V-8, World War 1 surplus engine that developed 90 horsepower. This engine was designed and built by Glen Curtiss's company, headquartered in Hammondsport, NY, on the southern end of Keuka Lake. The company built those engines by the thousands in World War 1 to power its Jenny (JN-4) training airplanes and other trainers. Curtiss had a major manufacturing facility on Long Island near Mitchel Field, on the south side of Stewart Avenue, and some of the buildings still exist. 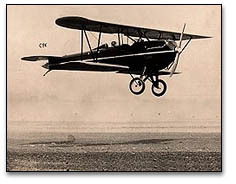 Ten years later, when the BIRD model A was designed, it was specifically intended to incorporate the still-plentiful, cheap, surplus OX-5 engines. Many other aircraft companies also used OX-5's because they were inexpensive and easily available. Note the "tunnel" cowling that directs air through the radiator. This cowl design was advanced for its time, and was a feature of the latest Curtiss pursuit aircraft. The BIRD model A looked "right" to pilots, and it was quite successful. The Cradle of Aviation Museum's model A (pictured) was built in 1928. In 1929, the Brunner Winkle Aircraft Company started building its BK model, a "3-POLB" (three-place open land biplane) which was equipped with the 5 cylinder, air-cooled, Kinner K-5 radial engine, producing 90 horsepower. This was one of a number of new engines designed in response to the boom in civilian flying brought on by Charles Lindbergh's flight over the Atlantic to Paris in 1927 from Roosevelt Fiel d. Dozens of new aircraft and aircraft engine companies were started, and shared some real growth until the 1929 stock market crash. At that point, many of the new aircraft and engine companies failed. The Brunner Winkle Aircraft Co. reorganized as the BIRD Aircraft Company, and was able to continue production perhaps as late as 1933 before it too gave up. 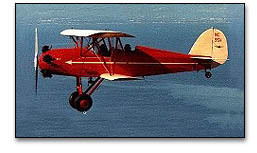 My BIRD, built in August, 1931, was a new model CK, with a larger, 125-horsepower Kinner B-5 engine. The model CK was a 4-POLB. Its forward cockpit was enlarged to hold 3 passengers with the pilot in the single seat cockpit just aft of the passenger cockpit. This arrangement, with the pilot aft of the passenger cockpit, was sometimes explained as being located there to help the pilot keep an eye on his "nervous" or "rowdy" passengers. A more important reason was that the weight and balance requirements of aircraft loading were better served by having the variable load (the passengers) ahead of the pilot in line with the center of lift of the wings. The model CK was also designed and certified to be a seaplane with the removal of the landing gear and the installation of EDO floats, which were built at College Point here on Long Island. My airplane's first owner was a potato farmer on Sound Ave. near Hallockville in Riverhead Town, who purchased it new in 1931. I purchased it many years later in 1968 from its third owner, who lives on Shelter Island. We restored it to flying condition over a number of years, and got it flying again in 1981. I have been flying it ever since, and our sons, too now fly it. Grandsons and granddaughters get rides whenever they ask. I was born the year before my BIRD was built. I was born looking up and loved airplanes from the first time I saw and heard one. As soon as I was old enough to learn to fly, I took flying lessons in a yellow Piper Cub model J-3, and soloed when I was 16 years old. The more I flew, the more I loved to fly and the more I revered the early airplanes. Especially attractive to me were the open biplanes of the '30s that I had drawn pictures of and made balsa models of as a young boy. My wife and children somehow understood my love of flying and aircraft. In 1967 I bought a restored 1929 biplane that had flown at Roosevelt Field just north of Mitchel Field. It was an Arrow Sport, model A-2, and that very airplane is now at the Smithsonian Air and Space Museum Restoration Center. We made a grass airstrip on our farm from which to fly. In many ways this flat and open farm area of the E ast End is similar to the Hempstead Plains, where Roosevelt and Mitchel Field were located. I have been flying my BIRD for 19 years, and love it greatly. It has a "sesquiplane" wing design. It was advanced for its day, the upper wing of the biplane being twice the area of the lower wing. It is a stable flyer with a high-lift airfoil that is honest and gentle and wants to fly. It takes off and lands at 40 miles per hour, and does everything with dignity and grace. The cabinetmakers who constructed the wings, in the Brunner Winkle plant at 7 Haverkamp Street in Glendale, Queens, constructed them with pride and skill, which I noticed and respected when I restored them. These craftsmen were a generation ahead of the Long Islanders who built the thousands of Grumman and Republic aircraft of WW II. Completed wing panels, fuselages and tail surfaces were trucked from Glendale to Roosevelt Field on the Clinton Avenue side, where BIRD had a hangar. There the planes were assembled and test flown. Then they were delivered -- usually flown to wherever in the country they had been sold. The famous pilot, Wiley Post, was a dealer in Oklahoma for BIRD. Altogether, about 200 BIRDs, of various models, were built. My BIRD has stayed right here on Long Island for its w hole career. In 1982, I flew it to Iowa to a national show of antique airplanes. You can't imagine how big this country is until you fly half-way across it at 1000 feet high and 85 miles an hour. I saw wash on the lines, the corn and soybean fields, the dairy herds, the coal fields of Pennsylvania and Illinois, the Mississippi River, and this great country lying out in front of the BIRD as it slowly winged over America. Charles Lindbergh taught Anne Morrow Lindbergh to fly in a BIRD at the Long Island Aviation Country Club in Hicksville. He could have chosen any make of aircraft in America in which to teach his wife to fly. But he chose the BIRD, model BK, because he knew what a fine, dependable, and honestly behaved craft it was, and he wanted the very best in which to teach Anne Morrow. Little more can be said except that the BIRD was a proud creation of Long Islanders, and its reputation wherever it flew across this great county said volumes about what the people of Long Island were to the aviation world. Surely the BIRD was a product of "The Cradle of Aviation." For more information on the Brunner Winkle Bird, visit our Golden Age section.